I’m a geek. That’s no secret. I mean “Jedipastor.org” right? 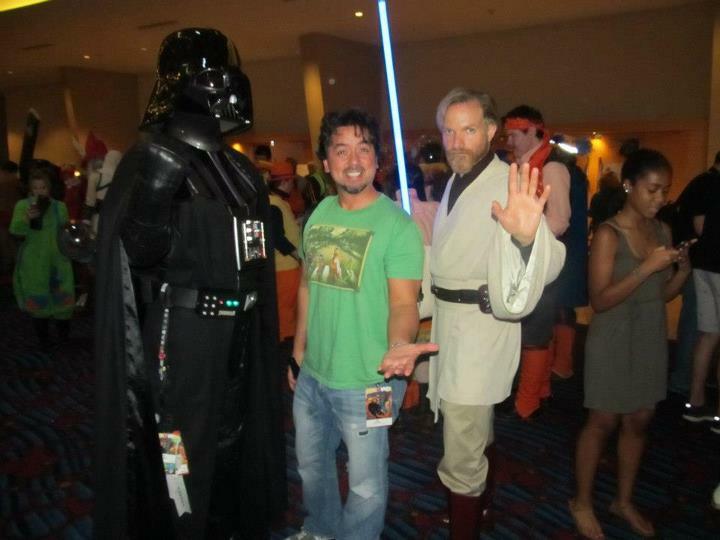 And by the way, that’s me sporting the goofy grin next to Vader. I do probably announce that truth to our church more times than the members care to hear about it. Most likely to the point where they’re saying, “All right, we get it Tim, you’re a nerd.” Yes, yes I am. And like I mentioned before in one of my teachings, I’m not the most articulate fellow in the world (which extends to my writing so please forgive any grammatical errors) and I didn’t go to seminary, or take a course in public speaking. But I know the subjects I’m passionate about. So if you want to ask me anything on (oh) say action figures, superheroes, movies, Jesus, art, and Star Wars (and not necessarily in that order) I’ll talk your ears off. So it’s my passion for such things that have richly molded me into the person that I so proudly am today. Well, that’s what my Mom tells me anyways. In gearing up to go to last week’s Dragon Con (the Super Bowl of geek conventions here in Atlanta), Howard Koepka half-jokingly suggested that my next blog should be an expose entitled The Six Things Churches Could Learn from the Con. I was amused by his suggestion and almost wrote it off until I thought about it some more. “Hey, you know what? I think my pastor might be on to something here.” So that weekend, I mentioned this idea to great friends of ours who were joining us for the Con and we took note to see what those things might be. Well, in mulling over this subject while there, I’ve condensed this list to four things. So with that established, let me share with you, what I believe, are The Four Things Churches Can Learn from Dragon Con…..
1) Essential Unity In churches today, there tends to be this “us against them mentality”. If you’re not a Protestant, Baptist, Episcopalian, Methodist, Seventh Day Adventist, Pentecostal, Catholic, or eve Non-Denominational, then you’re obviously not doing church “correctly”. Each prescribing to their teaching and worship styles over the other. At the Con, I was among a variety of Geeks in those three days. There were Harry Potter Geeks, Star Wars Geeks, Trekkies/Trekkers (they know the difference where I do not), Gamers, costumers, artists…you name it! And over the years, I never once saw or heard from any of those factions’ attempts to try to convince a person that their brand of fandom was superior to another. I didn’t see the Star Trek fan poking a Star Wars fan in the chest proclaiming Spock is wiser than Yoda or that Luke can flip circles around Kirk…which, by the way, He can… there were no contentions. In the grand scheme of things, there may have been that kind of debating but I’m sure to say that it was all in fun and never in ostracizing fashion. You see, in this setting, those non- essential items( or preferences) didn’t hinder the essential fun fact that everyone was there to celebrate one thing. We’re all Geeks! Well, that kind of unity attracts. And churches could do a better a job in recognizing how the non- essentials tend to be a divisive obstacle we create for ourselves rather than focusing on the essentials which would enable us to celebrate who we are, lock arms, and share God’s light in a highly effective way. How much more positively influential can we then be? Bottom line, at the Con, denominations sure get along. 2) Knowing Our Subject Matter Geeks sure know theirs! I can assure you that whatever preference a fellow geek is in to( be it a game, movie, book, art, costumes, or a great Sci-Fi show), it’s not just watched, read about, played, and studied “one” day a week. The fandom you witness at conventions is “experienced” daily in a geek’s life! They soak this stuff up to where they know “who” said “what” played by “you know who” on episode “so and so” which aired on channel “something- something” back in 1976 and it doesn’t stop there! They know their movies, directors, books, and authors and on and on and on! And they breathe it to the point where it’s part of their very being. I mean the more they know about it, the more they tend to be fulfilled in sharing it with others just as excited about the subject or to those who’s never heard of it. Believe me, that’s me! Well, how about that? I truly believe we as a church (not the building for corporate Sunday fellowship but as the body of Christ) should absolutely aspire to do likewise! We tend to adopt apathetic beliefs and merely save what we “want to know” for only a Sunday setting. One day a week. Well, if we profess who Christ is in our lives, should we not also commit to the study and historicity of Christendom to the degree where we read it, study it, and breathe it daily? Shouldn’t we also Geek out about it in the same exciting way? And like the Con setting, it takes commitment. And it should be a commitment that is the result of wanting to understand our history (His Story), grasp its truths and apply it fruitfully to our own lives. Listen the more we can learn, the more we’re likely to share that knowledge in a new, exciting way that can inspire people to consider our proposition and to look into it further rather than leaning on the un-inspiring and lazy “Don’t ask questions, Just accept it on faith” stance. It can be done but we really need to make an effort to know our subject matter rather than having it dictated by someone who doesnt believe in it. So let’s hit the books!